Chalk art has been an exciting means for artists to create realistic 3D scenarios for years, including such artists as Leon Keer and his popular chalk art works. Denver-based artist Chris Carlson has since taken the medium to a new level by transforming chalk art into short animations! 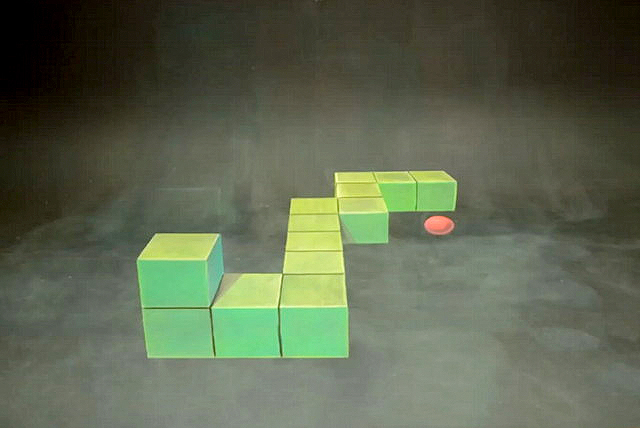 Based on the classic 1970s arcade game “Snake”, Carlson has recreated the game in a three dimensional space, showing the pixel-based creature working its way around the room and collecting orbs to expand its size. The animation has been uploaded to Youtube, as well as a short making-of, showing Carlson at work on the art. This work is just the latest in Carlon’s line of animated chalk art based on video game characters and other classic icons, all of which are available on their Youtube channel. Check it out and see some cool 3D chalk art in motion!